"Targeting the thousands of experienced IT Services Professionals to transform and build the bridge between Technology and Digital Business solutions for their clients"
"The changing face of education can be evidenced from the technological innovations seen in the sector that includes online education fueled by digitization of course materials. For a long time distance education was driven by reading material that used to be sent by post. However, technology has opened up a whole new world for distance education. Now teachers can train distance education students online. Naturally course material has to be put online too. This means digitization is necessary." What Does The Industry Say About NITI Aayog's AI Strategy Report? "Earlier this month, the NITI Aayog unveiled a discussion paper which addresses the national strategy on artificial intelligence and other emerging technologies in India. The government think tank identified five sectors to focus its efforts towards implementation of AI to serve societal needs. The five sectors are healthcare, agriculture, education, smart cities and infrastructure, and smart mobility and transportation." "The European General Data Protection Regulation (GDPR) has been in the limelight these last few weeks. And for good reason, too. It is an extensive document, to say the least. One reporter found that the number of pages in the document are enough to cover a football field — which is 360 feet long and 360 feet wide." "Technological advancements unfolding new jobs will soon become a norm across industries. India's IT sector has witnessed a massive transformation in recent years and today IT professionals have a whole new gamut of skills to look up to in order to excel in their careers." "Online test preparation is expected to be the fastest growing category of online education, estimated to grow at an impressive CAGR of 64% in the next 5 years"
Is India ready to embrace the full potential of online education?
" There is a subtle revolution underway in how India delivers secondary and tertiary education to its student." "If India is to fulfill the promise of rapid economic growth, then the country must train over 100 million young people within the next decade." "Our comprehensive guide to Online coding bootcamps, including the best Online code schools, reviews, scholarships, and more!" "Data is driving the work of most businesses and organizations. It is unlikely that this will change. The benefits of data science far outweigh the pitfalls along the way to building a better world using it." "AEON Learning, a Bengaluru-based edtech startup has raised $3.2 million in Series-B funding from MEMG Family Office LLP, a fund set up by Ranjan Pai, chairman of the Manipal Education and Medical Group." " AEON Learning, which has a staff of 135, generated a revenue of Rs 13.65 crore in 2016-17 and expects to close 2017-18 with a revenue of more than Rs 30 crore. It is now looking to partner with more universities, bring new courses on its platforms, and expand beyond the 150-odd towns and cities in the country where it offers services. “We have a prominent presence in South India and are planning to focus on expanding further in North and West India. becoming a one-stop solution for all worki ." AEON Learning offers technology to universities for their courses through its platform Avagmah. It reaches to 22,000 students across 66 countries, with 20 per cent business originating from the US." "Avagmah was founded in November 2013 by Karthik KS, Sankar Bora and Prasad G Palla. It has raised an undisclosed seed funding from Kris Gopalakrishnan and Atul Nishar in March 2016 and has raised a total of $5 million since inception." "The major achievement of the platform is its personaltzed study plan that schedules learning items across various subjects according to the individual student progress and learning time." You want to create an e-learning platform? Here are 9 tips to make it a success. "Markets all over the world have been going online. Be it ecommerce or e-learning, the use and accessibility of high-speed internet have brought about paradigm shifts in consumer behavior." "Business Start Up Funding, Crowdfunding for Startups, Startup Business Ideas, Plan for a Startup Business." "Avagmah, a start-up that enables users to pursue MBA qualifications over a mobile app, caters to learners in urban locations and is seeing a mounting number of takers in Tier II and III towns." "AcadGild, the online technology education start-up founded by Vinod Dham – popularly known as the ‘Father of the Pentium’ – and serial entrepreneur K Ganesh’s GrowthStory, is set to announce its first round of external funding." "Chennai, Sep 26 (PTI) Now taking up a distance education programme is just a touch away with the central Pondicherry University rolling out an App for direct delivery of courses such as MBA on mobile phones and laptops." "Student pursuing distance sducation can study their mobile phones and laptops. In an initiative to help working professionals acess quality higher education without taking a career break,"
"Over the years, we’ve moved significantly from learning to e-learning. Today, there are many edu-tech start-ups working at awareness and expanding the reach of the sector, and adding to the increasing number is Avagmah." "Avagmah was founded in November 2013 by Karthik KS, Sankar Bora and Prasad G Palla. It has raised an undisclosed seed funding from Kris Gopalakrishnan and Atul Nishar in March 2016 and has raised a total of $5 million since inception.The approach of Prime Minister Narendra Modi to foster Digital India is being well received by the people of this country. This approach would foster a new meaning to the education sector of India. According to a recent UK-India Council Report, ‘Meeting India’s Educational Challenges Through E-Learning’ India is the second biggest e-learning market after U.S.A. India’s education sector is going through a revolution, the direct outcome of the easy internet facility and low cost smart phones availability." "A big pile of books detailing varies sides of business. Long, mandatory hours of studying. Now, you can delete those conventional images of MBA learning. All you require is a mobile app to get the coveted degree, courtesy the initiative of Avagmah,a Bangalore-based startup." "AcadGild, which is launching in the U.S. today, takes a somewhat different approach from some of its competitors. Its programs combine small classes (with no more than 10 students) and a focus on mentorship from experienced teachers and 24/7 support with a project-based approach." "Two Bangalore-based school students have used their summer holidays to not only learn the nuances of building apps, but even created one that helps users make pledges around social causes. CNBC-TV18's Adith Charlie and Jude Sannith brings us that story." "Technology education startup AcadGild on Saturday launched social app vPledge developed by its teenage students, 12-year-old Prateek Mahesh and 13-year-old Priyal Jain." "You are now in your late 30s, fairly settled in your life and career. Life is good, but can be better. Looking back, you know you’ve been lucky, getting that first job and making those smart career switches when things were a bit sticky on the money front." 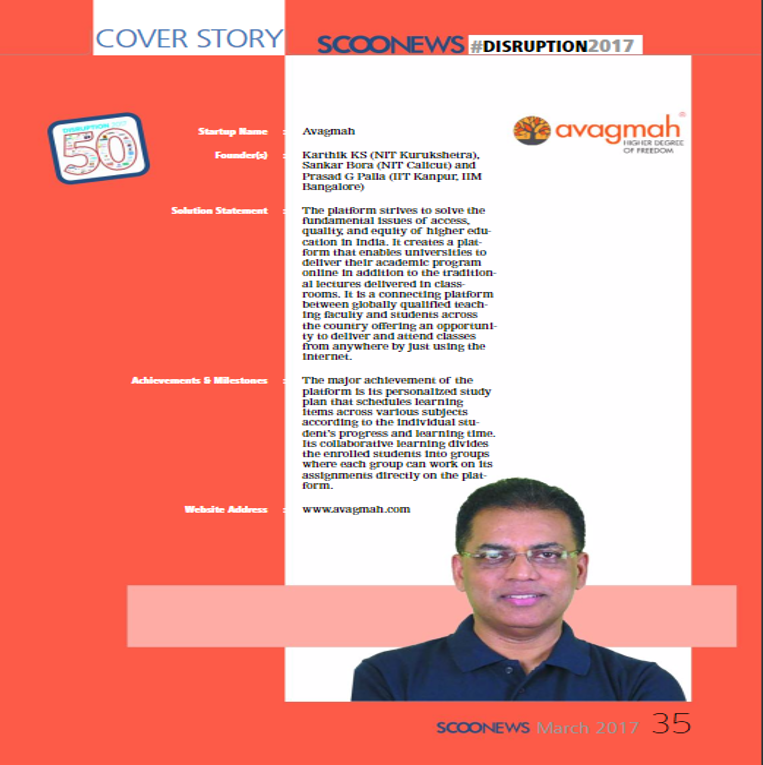 "Avagmah was founded in December 2013 by Karthik K S, who is an edupreneur. Karthik is an NIT Kurukshetra alumnus and a serial entrepreneur too. Karthik is the founder & CEO of Avagmah. Prior to founding Avagmah, he co-founded 24×7 Learning, Indian eLearning consulting, technology and implementation company. He also runs an NGO that helps educate and enroll underprivileged children into formal education. Karthik has over 23 years of industry experience and is deeply passionate about the education space." "Avagmah, which was founded in 2013 and focuses on helping universities of higher education deliver courses online, is already operationally profitable." "Avagmah's existing investors including Lionrock Capital, Singapore, Ganesh Krishnan, serial entrepreneur, and Neeraj Bhargava, founder and CEO of Mumbai-based investment firm Zodius Capital have also participated in latest round." "In the early 1980s, California, US-based engineer at Intel Vinod Dham rose to fame as the "Father of the Pentium Chip " for his contribution to the development of the Pentium Processor." Copyright © Aeon Learning Pvt. Ltd.
Avagmah and Acadgild are the property of Aeon Learning Pvt. Ltd.